Smoked spare ribs are king where flavor is concerned however, if you take the time to trim them up and remove some of the extra fat before cooking them, a great experience becomes an even better experience. 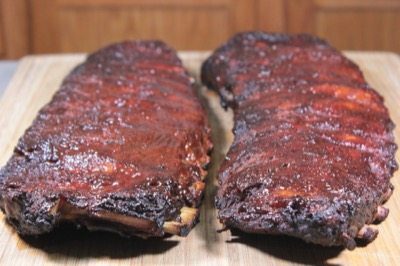 Cooking them in the smoker using the 3-2-1 method will create smoked ribs that are just the right amount of tender.. just the way most of us like them. 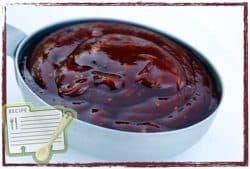 If you are smoking ribs without using my one and only original rib rub then you are missing out on one of the wonderful things in life. 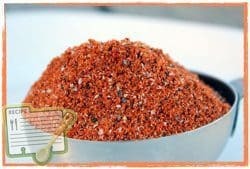 My rub was designed especially for ribs but is good on almost everything else you cook in the smoker as well. The ribs usually come in a thick plastic package. 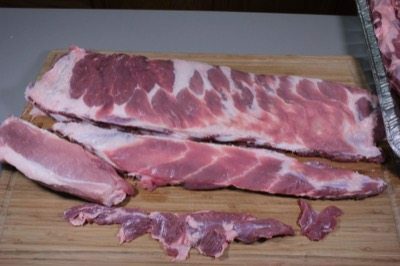 Remove the ribs from the package and give them a good rinse under cold water. Some say this is not necessary but, in my opinion, it's a good thing. Make sure the sink is nice and clean and you'll want to clean the sink afterwards as well. After rinsing, set them on some paper towels to drain. On the bone side of the ribs is a flap of meat called the skirt. 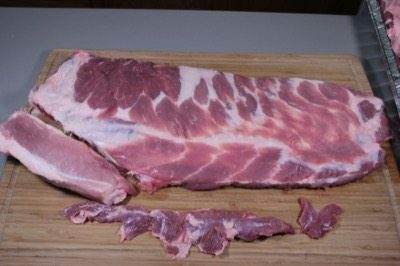 To make sure that the ribs are uniform in thickness and to help them cook better, it's a great idea to trim this off. 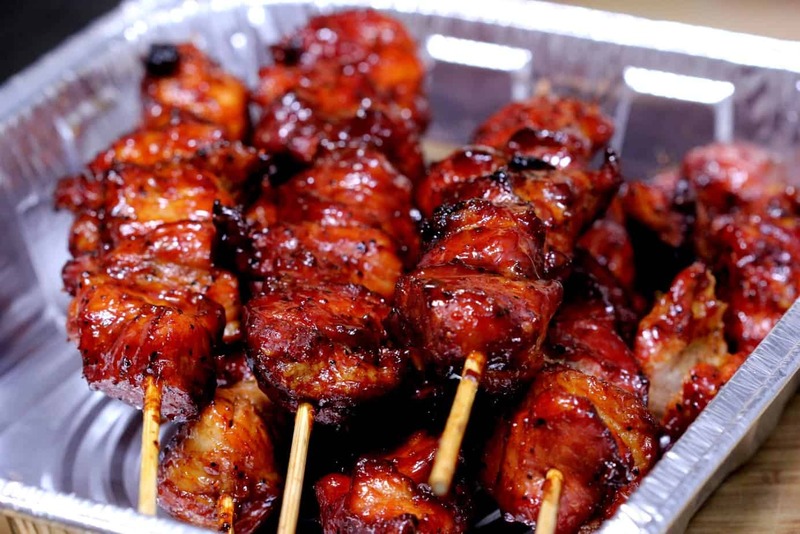 You can still cook it alongside the ribs and when it's tender (about 60-90 minutes), it's makes a great snack for the cook and/or cook's helpers. 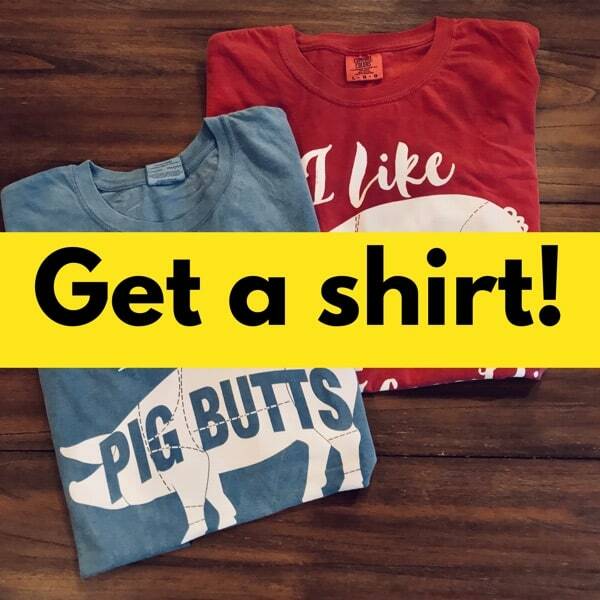 On the pig/hog, there are basically two types of ribs.. the baby backs and the spare ribs. 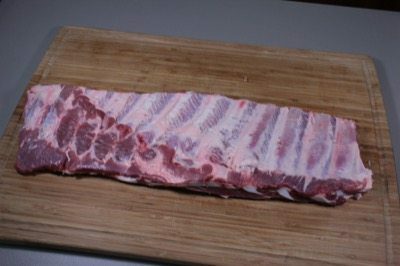 The baby backs have less fat and are a little more aesthetically pleasing (allegedly) than the fattier, more oddly shaped spare ribs. For this reason, it is common to trim them up. In doing so, a lot of the less desirable parts are removed and they end up looking more like a baby back. Next cut off the brisket bone which runs along the same side as the piece you just removed. If you feel carefully along the ribs, you can feel a joint separating the brisket bone from the rack of ribs. This is where you make your cut. 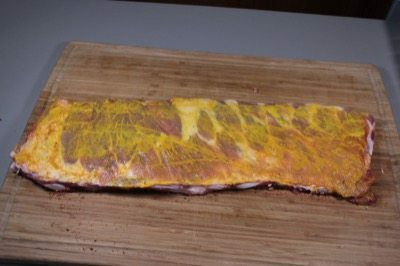 To finish the trim work, simply cut off the extra flap of meat on the small end of the ribs (right side of slab below) and you are finished. Place all of the extra pieces in a pan and set them aside. 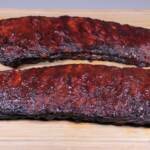 They can be smoked right along with the other ribs or you can freeze them and smoke them later. Once cooked/smoked they can be stored and added to beans, soups, stews, etc. for great flavor. 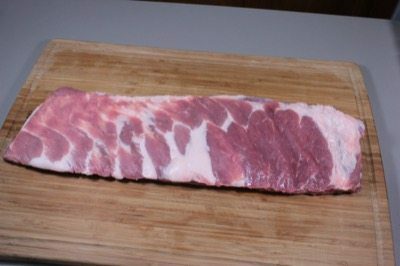 Here's the St. Louis trimmed spare rib.. see how nice and square it is?! This is the best part of the spare rib. This step causes folks lots of frustration and let me just say that it's not the end of the world if you have trouble with this. If you can't get it off for some reason, forget about it. It is nice to remove it but it's not worth a lot of frustration so try and do the best you can and leave it at that. It's hard to get a picture of this being removed but you simply lay the ribs with the boney side up. You will notice a thick plastic like skin covering the meat. Slip a knife or other sharp object under it and try to get enough pulled up so you can grab it. Use a paper towel for better grip.. Regular yellow mustard and the original rub added to both sides is the only thing you need to season these up. Squeeze on the mustard and rub it all over to create a nice sticky base for the rub to stick to. Note: you don't have to use mustard if you don't want to, you can just sprinkle the rub on the back side and let it sit there for about 10-15 minutes. It will mix with some of the meat juices and stick to the ribs pretty well on it's own. 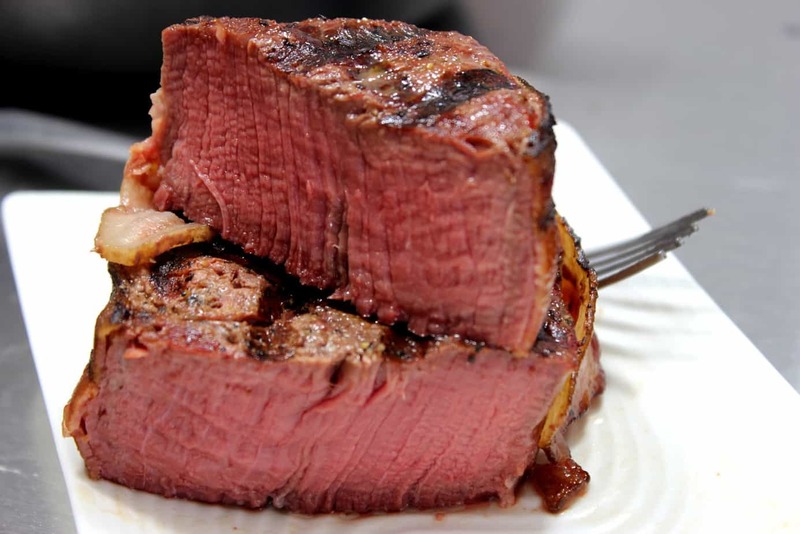 Flip it over and do the same thing on the meaty side. 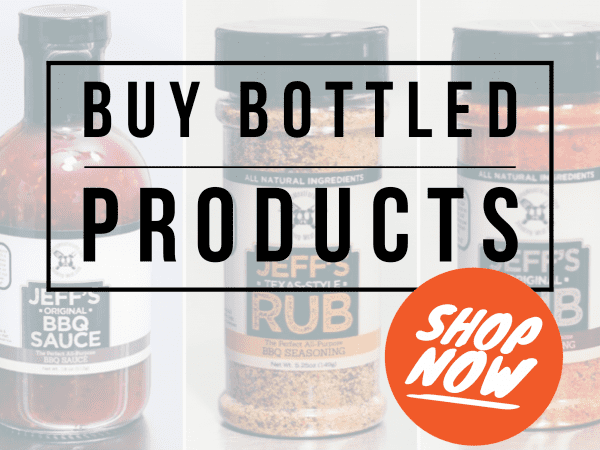 Pour on about ¼ cup of Jeff's original rub (¼ of a bottle) and spread it all over the ribs making sure you have full coverage. You can also sprinkle it on evenly using a cheese shaker or an old spice bottle with large holes. Flip the ribs over and do the same thing to the meaty side. 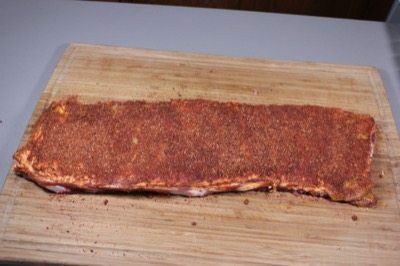 Once the ribs are seasoned, leave them laying while you go get the smoker ready to cook. 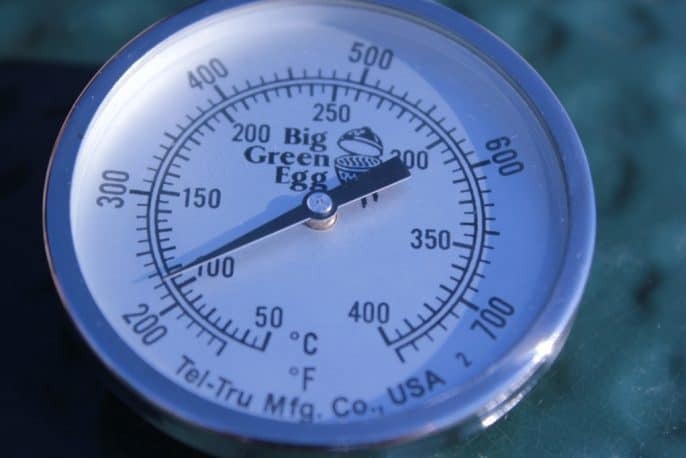 Set up your smoker for cooking with indirect heat at about 230°F using hickory or your favorite smoking wood. 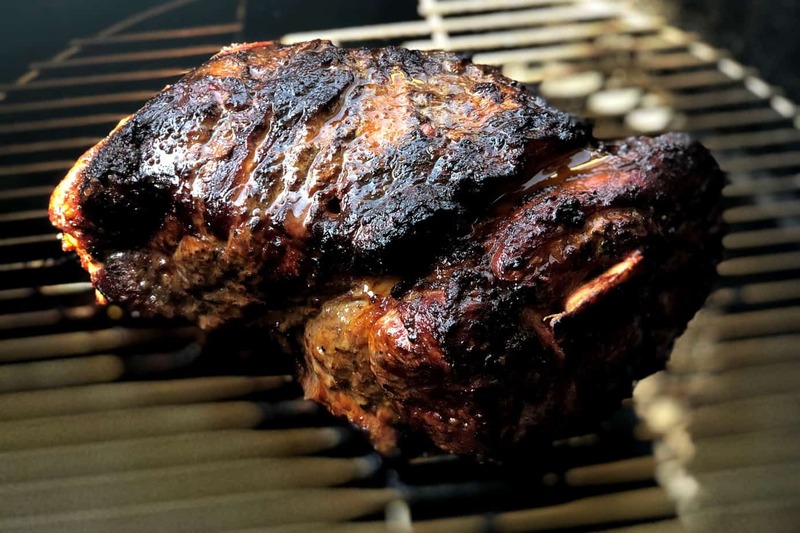 Once the smoker is ready, place the ribs bone side down on the smoker grate or if you are short on room, it is perfectly acceptable to use a rib rack to hold the ribs vertical. I also love doing these in the new pellet smoker by Camp Chef.. it's called the “Woodwind” and it's my go to smoker right now. 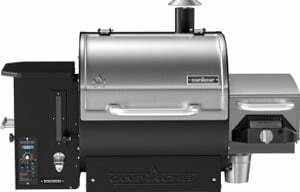 Tons of features and it smokes ribs like it was born to do just that! 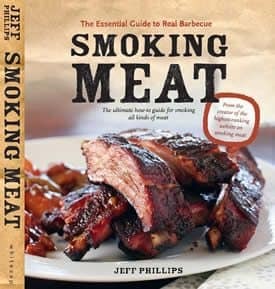 Check out the highly entertaining and informational video at http://www.smoking-meat.com/woodwind. After the ribs have been smoking for 3 hours, it's time to wrap them up and let them get the heat inside of a closed space so they can steam and get really tender. 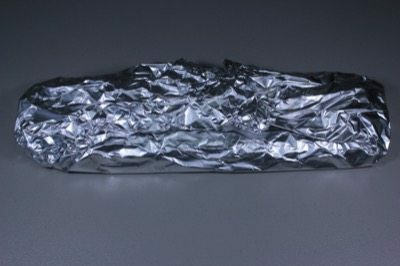 I usually get my foil pre-cut and ready ahead of time about 30 inches long and 18 inches wide. 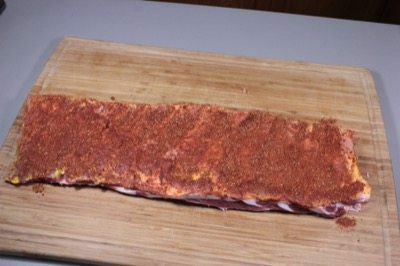 Once the ribs are ready, I can quickly take them off and get them wrapped without losing much heat. Note: Some folks add apple juice or some liquid to the foil. I usually do NOT add anything since I feel like too much moisture breaks down the rub crust that I worked hard to build in the first 3 hours. 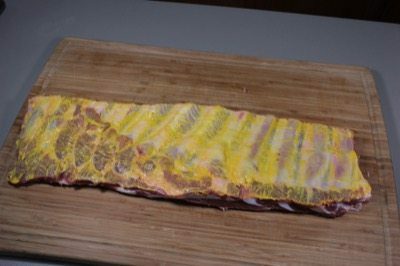 Place the ribs back on the smoker at 230°F but you do not need to add any smoking wood during this time since they are wrapped up. After cooking for 2 hours wrapped in foil, unwrap them from the foil and place them back on the smoker for a final hour to finish up. With or without smoke.. your choice. This is the time when the bark is finalized and it's also a great time to add some sauce if you like them that way. Some like sauce.. some don't. Remember it's your ribs. YOU eat them the way that YOU like them. If you like them sauced up.. then go for it and be proud. Place the ribs bone side up and slice them up with a very sharp knife. Serve them right away while they are hot! 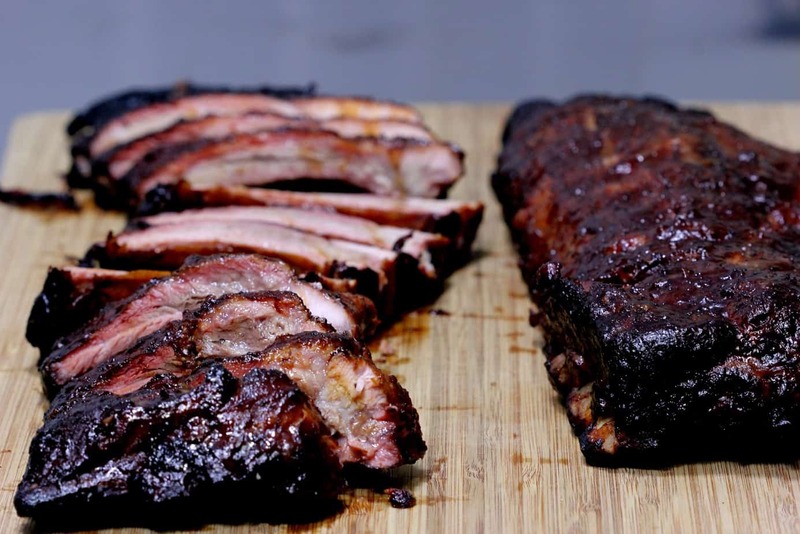 Smoked spare ribs are king where flavor it concerned however, if you take the time to trim them up and remove some of the extra fat before cooking them, a great experience becomes an even better experience. 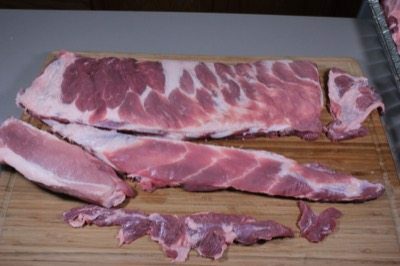 Remove skirt, brisket bone, and end piece to square them up and create the St. Louis style spare ribs. Pour on about ¼ cup of rib rub and spread to cover over meat. Repeat mustard and rub on meaty side of ribs. Setup smoker for cooking at 230 °F using indirect heat with hickory or other favorite smoking wood. Place ribs directly on smoker grate bone side down. After 3 hours, wrap in foil and place back into smoker for 2 hours. After 2 hours, unwrap and place back into smoker for a final hour. Brush on sauce if desired during last hour of cooking. Slice the ribs between the bones and serve with warm sauce on the side. I paid for your recipe quite a while ago. I only tried the BBQ sauce until today. Today is the day before the 53rd Super Bowl, and I felt like smoking spare ribs for the game. Since I have always liked ribs better the day after I smoke them, I thought I would run to the store and get the ingredients to make your original rub…I followed the instructions and worried about how sweet is was, but I thought that hopefully it would be OK after smoking them… O.M.G. I hope I can wait for the game before gorging myself. I trimmed my spare ribs so that I had quite a few little pieces to taste without actually tearing into the ribs, and I am so happy with the results that I hated to wrap them up for tommorrow! Thank You Jeff Phillips!!! ? So..I got an Oklahoma Joe smoker(the big nice one) for Father’s Day, I’m a Weber guy and don’t use gas, also I’ve never smoked any meat before, once I got used to how to control the heat, I’ve yet to smoke anything that hasn’t been good(butts, chicken, ribs and attempting cheese next week) I’ve tried the 3-2-1 method and been successful, also did the 4hrs at 350deg or so, and the ribs were awesome. I think Ive found my calling. Smoking for me is not “work” or inconvenient. It’s all about patience and finding what you like best. 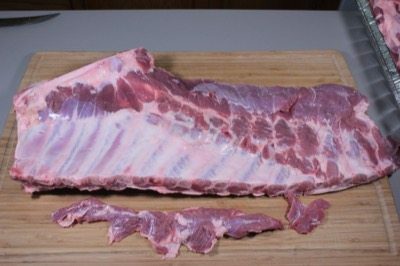 I personally don’t like my ribs “fall off the bone tender” and prefer a little pull to them. That’s why I use the higher temp and also use St. Louis style instead of baby back. Thanks for the informative recipe, it was a good start and can always be adjusted for your own personal taste. Why in the world do you want to make rib cooking so complicated? All that on off, wrap, on off, unwrap, on off…mush. It’s confusing, and difficult. This is all assuming you’re cooking St. Louis ribs at 225°. On so many forums so many people start with..”I did the 3-2-1 method but…”. It’s a pain in the grill. 250°-275° indirect, for roughly 4 hours, depending on actual temp, meatiness of the ribs, and how done you like them. Simple. I have never had anyone tell me these 3 steps are difficult or confusing. 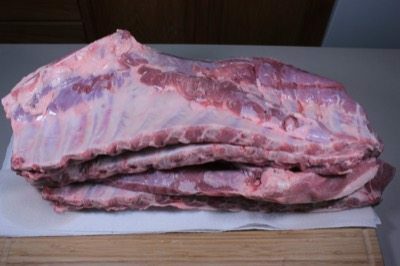 I have had folks tell me how easy and reliable of a method it is and how it turns out perfect ribs every time. I’m afraid I gots to go with the why do all the extra thing. My smoker is a wee bitty box I got from Wally world. It’s pure crap. And works like the devil needs your soul. 3 in, 2 in, 1 of, 3, 6, 8, 14. for Good God’s grace.i use a special wood, too, called yard wood. That’s the wood that falls in the yard. Sometimes other folks yard! He wasn’t being mean, nor am I. But to follow scripture and structure on such a thing as pork ribs isn’t the flavor of the game, brother. Flow. Relax. The 321 stuff needs to stop. Finally someone who does not make the process so complicated. Direct and to the point! I’ve been racking my brain for months for something that makes sense! Thank you! Just goes to show you that the best things are sometimes the simplest! 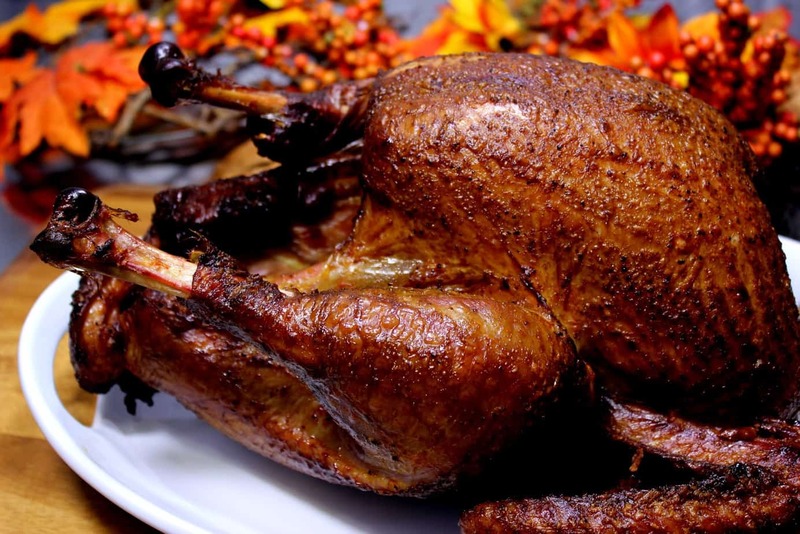 I don’t have a smoker, just a 16″ diameter x 26″ long grill (1/4″ thick steel). Right now I cook ribs in an oven for 3 hours at 275 DegF and finish off 20 minutes or so directly on the grill (after the chicken , steaks and sausage are done). Yes it’s a trick to get the ribs on and off since the bones are falling out while doing it. 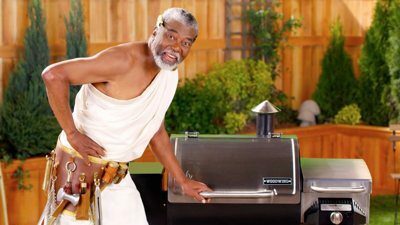 How can I smoke/cook the ribs the whole way on a standard charcoal grill using your recipe? I don’t know what I’m doing wrong, but I followed the recipe to a T today and again the same result…great flavor, a bit fatty inside, and the only way I can get it to inner temp 195 is to leave in foil for last hour or crank up my Daniel Boone GmG to 300 for about an hour. I just tries this 3-2-1 method for the first time.I have a Range Master ( Master Built) 30″ Electric smoker. I preheated my smoker to get the wood chips smoking well, probably around 350*. I then turn the controls down to low and put my ribs in as it was cooling down. They smoked very well and I kept the temperature around 230 – 250, occasionally it would creep up to 280. I smoked these for 3 hours, then I covered in foil with a water cinnamon snaps mixture. I kept the heat the same and cooked for the 2 hours, I then added some more chips to get the smoke going and cooked for the additional hour. I did turn off my smoker 10 minutes early and let it cool down while still cooking the ribs. They came out perfect. Nice and tender, fall of the bone. 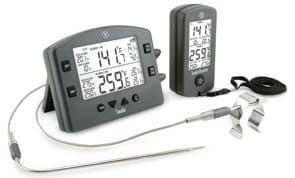 I do not use a meat probe thermometer on ribs because you get a false reading due to being close to bones. You can use the tooth pick through the meat technique to make sure the ribs are done. I used a cinnamon and sugar rub with some McCormick Grill Mates Montreal Chicken Seasoning sprinkeled on top of the rub. 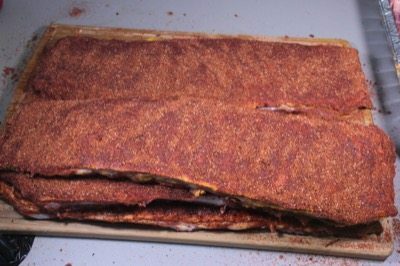 Love the rub recipe, just started in on my St. Louis ribs and they are delicious! 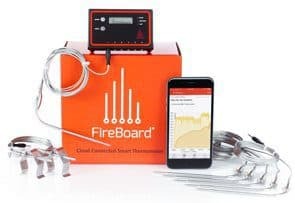 Over the last 2 years I have really appreciated all the Great information provided by Jeff on this site. This was awesome! Family commented it was the best ribs they’ve had. Question though – anybody have recommendations on what to do with the trimmings? 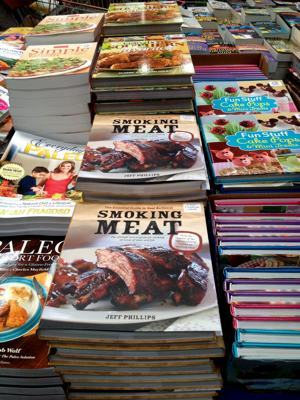 I smoked them as well and they came out as kind of a rib jerky – just kind of dry. I imagine it’s because they aren’t as thick as the actual ribs. Any thoughts on this would be greatly appreciated! 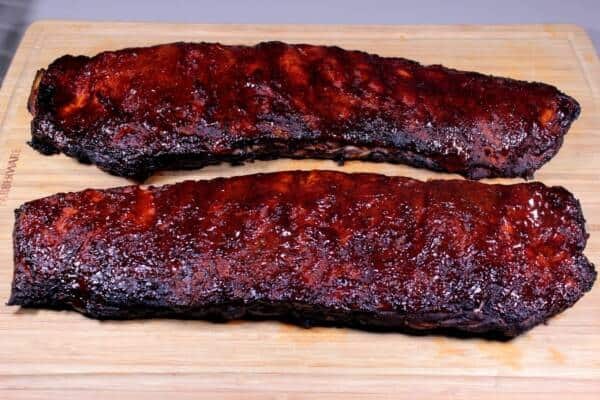 I smoked them right along with my ribs 3-2 no 1 at the end I wrapped them in foil with a 1/4 cup of Apple juice like I did the ribs and took them off after the 2 hours they were great far from jerky. Jeff, ever since I bought your reciepes (wonderful by the way), I no longer receive the newsletter. I look forward to it every Thursday so we can sample it on Sat. night. I have tried to subscribe again but it tells me I am a subscriber. Help, my family is starting to turn on me! Thanks! David, I am also showing that you are subscribed and that we are sending you the ad-free newsletter every Thursday morning. I suspect that your spam or junk filter is catching my emails for some reason. You may have a junk/spam folder that will allow you to see what is getting caught and you can then click on it and mark it as wanted email. I have used this recipe many times and it works great. 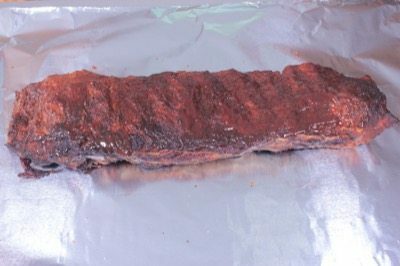 I have modified it to 3 hrs in smoke (apple/cherry/pecan) at 235, then 1.5 hrs in foil, then 30 minutes at 250 turning once..seems to give me a rib with a little more bite tension. Coat with BBQ sauce or mop in that last 30 minutes. Wow, another great Meal thanks to Jeff! I have tried just about everything in his Book, you follow the instructions and you cannot go wrong. Now I am the acknowledged “expert” on smoking in my family. What I learned came all from Jeff, and his fantastic book! If a ‘Dummy” Like me can do this, anyone can! Once again Jeff Thank you.